We have a selection of several designs, for you to choose from. 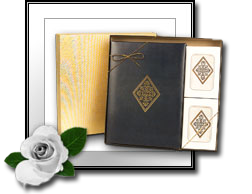 A complete line of acknowledgment cards, service programs, memorial bookmarks, photo register books and prayer cards are currently available. Give us a call at (914) 949-0372 to discuss your memorial stationery needs. We offer a selection of theme-based and photo laminated memorial or prayer cards. Often given to funeral guests,a laminated card can become a treasured keepsake.